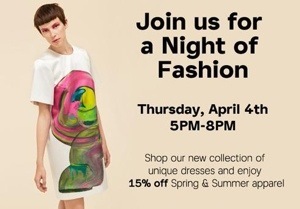 If you love bright colors, swirling patterns, and Finnish design, head on over tonight to Marimekko for their fashion event including 15% off their Spring/Summer apparel. If you can’t make it tonight, worry not my friend! From all day Friday, April 5th to Sunday, April 7th, there will be plenty of Fashion Week activities at Marimekko including the 15% discount. Have fun! And remember kids…only you can rid Summer and Spring of skinny jeans and all black ensembles.